When a US-listed company releases their earnings they often do it via a non-statutory press release (translation: most likely written by their financial PRs). The actual normal filings (a form 10-Q for quarterly results) normally becomes available a couple of days later. Facebook's 10-Q is now available to view here. As I've said earlier, its best to read filings from back to front as all the interesting stuff is always in the footnotes. Similarly here - nothing earth-shattering (the headline numbers are already out) but just some detail which the company didn't mention on the press release. Two nuggets - mobile-only MAU's were up 23% sequentially to 102m, versus an increase of only 6% for overall MAUs. Remember one of Facebook's big revenue problems is that revenue per user is much lower on mobile than desktop so the more mobile-only users, the less ad revenue Facebook gets. Not a direct comparison, but for reference Zynga said on its Q2 call that its ARPU for mobile users is roughly half that for desktop users. 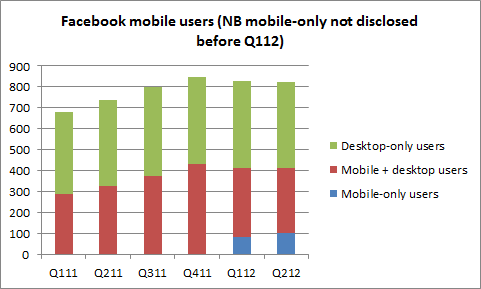 Secondly Facebook disclosed that Zynga accounts for 10% of group revenues (down slightly from 11% in Q1). Ads from pages generated by Zynga accounted for an additional 4% of revenues (similar to Q1 but down from 7% of group last year). Interestingly if you strip out Zynga revenues from Facebook's Payments split, it shows that ex-Zynga payment revenues (a segment which should be growing fast and is potentially a high-margin revenue stream for Facebook) only grew 6% sequentially to $74m. Facebook has been early to the payments game but still looks lamentably under-scale in this space. Seriously, when one of your main products does not work (Dead Air More Effective Than Facebook Ads - http://adcontrarian.blogspot.com.au/2012/07/dead-air-more-effective-than-facebook.html), how long can a company last? And when ad revenues dwindles, its free services model means the more it grows the more money it loses (and the quicker it dies)? Yes, this is the curious thing about Facebook. Compared to Google, the benchmark for web advertising, its ARPU is horrifically low. So something is clearly askew in how it connects its assets (all that wonderful user data) and its revenue. The question is whether this is structural (i.e. people search on Google when they are looking for something and thus more likely to click through) or simply execution (Facebook aren't targeting ads well enough, should use more Sponsored Stories etc). Structural challenges are much harder to fix than execution ones. My gut feel is that at least some of the gap is execution. I don't think people are any less engaged while they are surfing on Facebook than Google. And they probably spend more time on Facebook. So in theory FB should be able to raise ARPU if they get their act together. 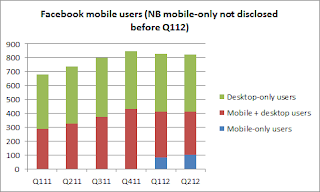 However on the other hand the shift to mobile is diluting ARPU at the same time. That is the bigger risk. Facebook appears to be a poor platform for ads. My understanding of online advertising dollar is that search works but ads don't. So it's worth paying for SEO and ad based on search but not banner ads. Yeah. The bizarre thing though is that Facebook should have the best and the brightest minds working there so if anyone can crack it they can. The problem may be sustaining the best and brightest minds for an empty cause. And it seems difficult to be innovative within a large machine; seems everything they do gets overshadow by the overarching brand. Perhaps they should spin off more companies instead of acquiring companies. if nothing else this should be a positive for share price?